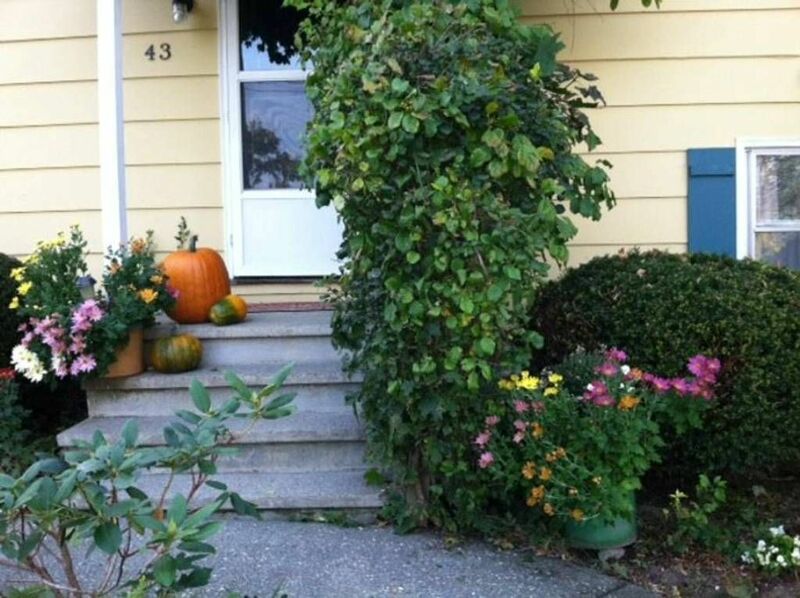 Studio near UVM - free tennis/pool/cross-country skiing - on quiet dead-end St. Located within walking distance to The UNIVERSITY OF VERMONT, the UVM HOSPITAL- or a 5 minute UBER ride to downtown Burlington, with it's prolific shops and restaurants on CHURCH STREET, or to the nearby U-MALL, or even the close beaches of LAKE CHAMPLAIN. You might also enjoy a BREWERY TOUR or a full day or two visiting the SHELBURNE FARM & MUSEUM with it's PIONEER VILLAGE, a real landlocked STEAMSHIP -Ticonderaoga, -as well as many other EXHIBITS. Your SuperStudio offers a comfortable queen-sized sleeper couch with a firm foam mattress topper - an attachable hassock and an air mattress. Enjoy also your large eat-in kitchen; private bath:, private washer/dryer and a fenced-in back yard for your pet..
From this special vacation location you will see UVM horses grazing peacefully year round; as well as seasonal corn fields, and Country Club greens sprouting along ample bike-paths! During summer months, you will also have free access to the BURLINGTON TENNIS AND SWIM CLUB located on our quiet dead-end street. It has an olympic-sized swimming pool and eight clay tennis courts as well as a children's playground. For year-round gym activities there is the nearby "the EDGE" with indoor swimming pool, hot tub, bone-warming sauna and of course exercise equipment - all for a low day rate. Try out this super cool Super Studio Apartment for a fun filled summer week or month. From this comfortable spot, you may just fall in love with this super Green State of Vermont! Personally - for me - this spot is paradise! From this humble home I can see snow covered mountain tops, or year-round green trees, changing meadows, corn fields and grazing horses - while only minutes from downtown shops and businesses. In my backyard, bouncing squirrels, busy birds and any sort of field creatures have a "hay day" in my vegetable patch and fruit trees. Red cardinals and blue jays visit my bird feeder during winter snowstorms, painting magnificent "live" portraits that change by the minute. I got here "by accident" following my son who was attending the VT Law School - a choice (I feel) prompted by many years of family ski trips to the slopes of Stowe and Mad River Glenn (of "ski it if you can" fame.) "Come and live in Vermont", he told his now single mom (who had lived in many major cities such as Berlin, Vancouver, Seattle, SanFrancisco, Chicago and New York). "The people are really good here!" To humor him I came for a year - twenty years ago! He has, of course moved on - and no matter how many times he "invites" me to join him and the grandkids - I'm like already living where I ever wanted to be - at this time in my life! As luck would have it - now my three sons and their families come and visit me - for Sommer camping and Winter skiing - right back here in wonderful Vermont! You are connected to nature here in South Burlington, sprouting agriculture, managed forestry and yet minutes from downtown Burlington City and Lake Champlain life. Battery Park at the waterfront offers cruises, with dinner on board or at shoreline restaurants. You can even walk on the lake - when it's. frozen in the wintertime - all the way to New York State. Our you might enjoy a day trip to Lake Placid with its Olympic Ice Rink of the 1980's Gold Medal Hockey team fame. Or watch ski acrobats slide down with skis and bathing suit into a pool of water practicing their aerials. But back to the Burlington waterfront which sports ECHO the Leahy Aquarium maritime science center; or Shelburne Museum which sports not just quilt and/or merry-go-round exhibits but a whole pioneer village or "landed" steamship the Ticonderaoga on which you can explore sailor staterooms - in season.